Home » Buying Tips in China » What's the procedure of mold quotation and ordering? There are no hard procedures for ordering new injection molds, but I would take the advice of those that have contributed and perhaps make a list of your own procedures to follow for future purposes. The tooling is not where you save money on a project. It helps some to know the tooling manufacturer and his capabilities, but, you need to start with a targeted Product Cost and a Projected Annual Volume to determine cavitation and press requirements. From there you can estimate the manufacturing costs and where your company needs to be to achieve the profits required to support your operations. These are the basics required to develop the minimum specifications for the injection molds required. At that point you can potentially quote the tooling to your specifications and have quotes comparing apples to apples anywhere in the world. Then you must consider the shipping charges and the timing required before production start-up as this will have a major impact on your program costs. I regularly check costs between China mold and US mold in this manner. Recently look at Europe compared to US in the same manner. It's not the price of the mold that is the most important, but the cost price of the product that is made with the injection mold. Depending on the volumes: if the volumes are small the share of the mold in the product price is high, so you have a small number of cavities, maybe not a hot runner and maybe even an aluminum or non-hardened mold. If you have big volumes you can only make money with fast cycle times, which means a higher number of cavities, most likely hot runner and a very good optimized cooling in the injection mold. In this case the share of mold in the product price is only 5-10% and the price of the mold is not that important anymore, because with a good injection molding process you can earn more money with a good (but maybe expensive) mold that will work from the first shot and during a 24/7 production for the years to come. Besides that there are also other important aspects as optimized product design (wall thicknesses, max flow length), type of resin used and injection pressure needed to fill the part. When high injection pressures are needed you want more injection points on the product to prevent stress. So to answer the question "Where can I find some procedures regarding ordering new molds", my advice would be to ask the mold manufacturer if they have previously engineered molds for your type of injection molder, I would also seek customer references for the manufacturer and as mentioned before visit them and take a really close look at a) the storage of WIP molds b) their tooling and fabrication area. We are involved in manufacturing plastic lollipop whistle sticks. 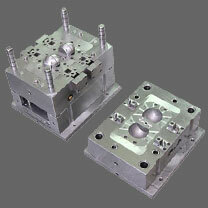 we are in requirement of mold for the same product.